A group exhibition of artworks by Erik Laubscher, Jacobus Kloppers & Walter Meyer was held from 23 November – 8 December 2004. There is no safer way of avoiding the world than through art, and there is no safer way of being linked with the world than through art. - Goethe. Experiencing the landscape is a spiritual experience for Erik Laubscher. His paintings become the poetic language of his emotions – the experience of his reaction to the vastness and varying contrasts of the South African landscape. He unifies lines, forms, colours and textures into ordered compositions - capturing the emotional impact of the landscape. The result is a celebration of the magnitude and expansiveness of the land. He admits that he is unable to paint if not enthralled by the atmosphere created by the forms and contrasting elements before him. These are the elements of his composition - emotion is transformed into logic - with his colour palette he arranges his inner perceptions on canvas. For sixty years Laubscher has been involved in depicting the South African landscape - forever the scout and explorer of different perspectives that speak to him in new ways. He is constantly refining his powers of observation and continues to make new discoveries when revisiting familiar scenes, specifically in the Overberg and Swartland. In recent decades his quest has been to capture the intrinsic essence of his experience of the scenery portrayed in these compositions. Erik explores the landscape with the eye of a photographer, and speaks of luck – to be in a particular place at a particular time to capture that special moment. As an artist he becomes a seismograph of the infinite moods of the landscape. This exhibition provides another opportunity to witness Laubscher as the visual articulator of a particular landscape. He works with what he experiences visually and emotionally, and concentrates it to its poetic essence. The magical power of his art lies in the way that it creates an opportunity for the personal experience of others through his interpretation of a particular scene or region. In the Overberg series of paintings his particular challenge was to work on a smaller scale using different media – watercolour and pastels in addition to oils. In September 2003 he spent a day in the vicinity of Caledon and Riviersonderend. In the following weeks ten sketches became ten works on exhibition. He puts it so simply when he says: “My eye catches something and it stays in my head”. In his studio these impressions are transformed into unique compositions of form and colour to create the desired atmosphere. 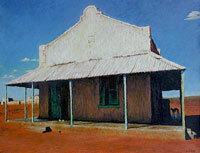 Another series of paintings arose from a similar exploration in the Moorreesburg and Riebeeck West vicinity. In the vastness of the Swartland environment the artist is often taken by surprise when abstract, contrasting forms virtually loom up on the horizon. Their stripped quality and barrenness can momentarily be transformed by an unexpected light, cloud or range of mountains in the distant background. Realism is transformed into abstraction. Arresting patterns in the landscape are juxtaposed, producing a monumental depiction of an intense experience of the landscape. The enchantment of such discoveries offers Laubscher the reward of paintings capturing the essence of the experience, and not the sentiment evoked by a picturesque scene. His experience of the expanses of the South African landscape enables him to breathe freely – in his sensory perception of it as well as in presenting it on canvas. 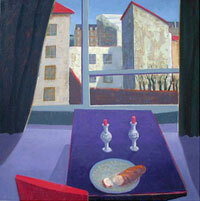 Lausbcher’s still life paintings compliment his landscape studies. The basic training and understanding he absorbed from the French master, Fernand Léger, remain his points of reference. What he learned in Léger’s studio in the 1950s in Paris remains the dicta according to which he works. Having adapted Léger’s rules and guidelines as the basis for his still life paintings, objects are grouped to achieve maximum expressiveness. What emerges in the composition must be the logical consequence of the arrangement of lines, forms and colour. As for Léger, the essence of Laubscher’s compositions lies in weighing up contrasting values against one another, in order to achieve a state of orderly intensity. Movement, volume and tension created by contrasting elements are the dominant features of his work. His still life paintings are refined studies produced by a sharp eye and independent spirit. He transforms the ordinary to present it in an excitingly unique way. The poetic element in his compositions is sensitively controlled, leading to the discovery of new visual adventures. The works on this exhibition depict an inner power gained from their attachment to South African, and specifically Western Cape, soil. His work converts the vastness and expansiveness of the landscape into compositions that fill the viewer with ecstasy. The experience becomes a celebration of an unbreakable bond with the land. Erik Laubscher’s work speaks of integrity. The well-defined imagery, the powerful mood and the indisputable craftsmanship reflect the truthful interpretation of his experience – the hallmark of his artistry. It is ironic that the notion of ‘places’ not only implies the ‘empty spaces’ between them, but also depends on them. Without these ‘voids’ the concept of ‘place’ would be incomprehensible. We order the physical world as a set of places, connected by paths – spaces that seem ‘empty’ and ‘less important’, but which we have to travel in order to reach a destination. For some time now, Jacobus Kloppers’ work has been focused on the concept of travel, the realisation and discovery of landmarks and indicators along the way, and particularly, the impact it has on the psyche. He has walked a long way – initially through depictions of objects (dams, drinking troughs, gates, etc.) along roads leading through the Karoo landscape, later the road itself as a (non) place, and more recently, by focusing on road signs as indicators of place, distance and direction. Now he enters what he calls a ‘second world’ - to extend his investigation into the ‘continuous interaction between the experience of place as a physical phenomenon and of place as a moment in the world of thought’. By superimposing illustrations of clouds on road maps and using aerial photographs as references, Kloppers is now involving the virtually immeasurable space above the landscape – the atmosphere, the true place of ‘nothing’. On a clear day the sky is an empty space where distance, relativity and three-dimensionality dissolve in a borderless vacuum. Only physical objects, such as birds, aeroplanes and, especially, clouds, sometimes give (limited) insight into the dimensions of the immense expanse above us earth-bound beings. Without these indicators, of which the landscape is part, we would not be able to grasp the concept of space. The human psyche – the universe of the spirit - is as boundless as the atmosphere. It is only defined, and limited, by thoughts, stemming from experiences of happenings, of places and the journeys between them. In this series of works, Kloppers employs, amongst other things, the cloud as a metaphor for the wandering spirit. Clouds drift over landscapes, carved by time and incidence, as thoughts and dreams travel through psychological spaces above past and future experiences. The human spirit may not be without will, but, as clouds, we have no control over our origin, and relatively little control over how and where we end up. It is the winds of time and change that ultimately determine our route and final destination. We can be little more than observers en route. Travellers never stay for long in one place. They love movement for the sake of movement. In the process, travellers usually develop a firm concept of space and place - and especially the absence of the latter - because to travel, means to be in the ‘nowhere’ between two points on a map. It is these vacuums that Zen Buddhists long to visit in an attempt to escape the hold that place and experience have on the psyche. To them the ‘non-place’ is the true destination. This sounds paradoxical. For what is to be found in the no-man’s-land between places - an ill-defined space, where little is certain and most things are in a constant state of flux? What are we searching for along these strange routes of uncertainty and transcendence? Do we ever discover anything? Sometimes. Kloppers points to this. Through the metaphor of the physical road, the landmarks and signposts along the way, the road map, the endless sky and the floating clouds, he again focuses on a certain, but universal, aspect of the human condition. Like nomadic clouds that glide over the seemingly empty spaces between the dots on a map, we see, hear and experience many things during our journey over the psychological landscape. We may learn a lot, and later know many things, but what we eventually discover during our travels through lesser-known spaces, is nothing but ourselves. The landscape - continuously transformed by nature or human activity - has many faces, and many stories to tell. As the arena of life, it is a collection of innumerable tracks; a document of past and present occurrences from which we can often read what the future may hold. As we inhabit and transform the landscape, the terrain and its elements also have an impact on us, both physically and emotionally. This interplay of forces has a major influence on the identity and condition of both the landscape and the people who inhabit it. Although this is quite obvious, it does hold the key to why Walter Meyer’s paintings of the Southern African landscape so often leave a haunting and memorable impression on us. On a technical level, his loaded brush, saturated colours and dramatic interplay of deep shadows and brilliant, shimmering light, do enough to elevate his brushwork well above those of many other accomplished painters. This allows him to render virtually any landscape into a beautiful and visually soothing vista. But this is exactly where the sting lies, because Meyer’s subject matter - especially its psychological subtexts - is a different story altogether. When he casually says he merely paints what visually strikes him, he is actually being very specific about it. And this in particular gives his art, although rooted in the centuries-old traditions of oil painting, a contemporary edge. Instead of depicting beautiful and serene scenes - as so many decorative artists do - Meyer has become known for expressing at best the mundane and at worst the less desirable side of reality. He currently focuses particularly on the harsh semi-desert that constitutes most of the South African platteland – the Karoo and the Kalahari. Meyer’s paintings speak little of the rural world as an exotic holiday destination where time stands still and life is free, easy and uncomplicated. Instead, through his eyes the remote countryside is for the most part dotted with empty and lonely places. Here the relatively few human inhabitants are seldom seen, and very little seems to happen. But signs of human drama - of physical and mental struggle, shattered dreams and often complete failure in a virtually hostile landscape - are everywhere: in derelict old houses and bare and neglected backyards, rusted cars, empty town streets and deserted Kalahari plains where the struggle to survive is seen in the crumpled shapes of dry trees and shrubs. These paintings grip the viewer on many levels. The glorifying effect of Meyer’s exceptional (however still traditional) brushwork versus his uncompromising and realistic depiction of mundane, sometimes sad and often melancholy contemporary rural landscapes already create a strong tension in his paintings. This in itself is enough to hold one’s attention. But there is more. Meyer does not necessarily speak a new or innovative visual language, but his pictures illustrate a universal truth that we all secretly know. That the small moments in life, the trivialities in the world around us, the wear and tear of time, and the apparently insignificant happenings often speak more - and with more truth and authority - about the past (and particularly the present) than most monuments or official histories do. These melancholy depictions of largely forgotten and deserted worlds furthermore linger in the memory because we not only distinctly recognise these landscapes as physical parts of Southern Africa, but are also reminded, as we have specifically realised in the last decade, that the old must eventually give way to the new. We also see another side of ourselves in these works: that we are also drifters through time and space - sometimes accepted by the land, and often rejected by it. On both accounts, this leaves marks on us, as we leave our tracks on the landscape.